1. An identification with people who have a similar personality to one's own. 2. Interest and sympathy for those who are in the same situation as, or are otherwise, similar to one's self. 1. An attitude or way of behaving marked by unselfish concern for the welfare of others: After the earthquake, there were many who, out of a sense of altruism, volunteered to help the victims. 2. The belief that acting for the benefit of others is right and good: Pearl's cousin had a sense of altruism that motivated her to travel to developing countries to work as a teacher. 3. 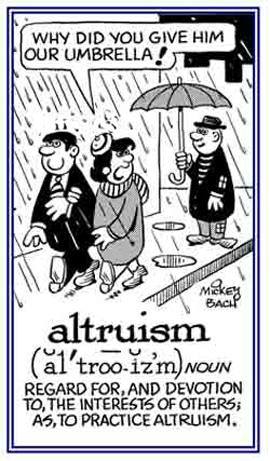 Etymology: from Latin alteri, a form of alter, "other, another". © ALL rights are reserved. A situation that exists when someone has virtually equal command of two languages: When Doris moved to Quebec, Canada, from France, her ambilingualism of French and English made it easy for her to communicate with the local citizens. 1. The ability to move by cytoplasmic streaming and the formation of pseudopodia, as in ameba. 2. Infection by amebas; amebiasis. 1. An infection or disease caused by pathogenic amebas; especially, Entamoeba histolytica. 2. Amoebae, or amebae, inhabit the large intestine, where they cause ulcers and inflammation which can mimic ulcerative colitis. A state of being amorphous; especially, a state of being without crystallization even in the minutest particles, as in glass, opal, etc. A Condition in which a person is able to conceive of himself or herself as a male or female or both simultaneously. Possession of both ovarian and testicular tissue; true hermaphroditism. The quality of exhibiting the characteristics of an acid and a base and having the capacity to react either as an acid or a base. The advocacy of adult baptism on the grounds that only as adults can people responsibly accept and declare their faith: Anabaptism is a term given for those who practice re-baptizing mature Christian converts who already have been baptized as infants. The churches of western Christendom that separated from the Roman Catholic Church during the Reformation resulting in some Protestant movements in the 16th century that believed that the Bible was the most important guidance for Christians and so some of them were practitioners of Anabaptism because they were convinced that only those who were old enough to make decisions to become baptized believers, and not infants, were the true believers. Showing page 4 out of 63 pages of 943 main-word entries or main-word-entry groups.